I know, I know, there's no way that you could have known that I was having a tough day week month. As your entire car load of free spirited friends rolled down your windows to peer at me and my three children waiting for the light to change so that we could cross the street, I thought that maybe you were actually happy to see children. Maybe they reminded you of your own children or grandchildren or something. I know that I smiled back, automatically, because at first you seemed so friendly and all of your attention was so clearly pinpointed on our little group and it would have been awkward to act as if I didn't see you when you were right there. I was tired. It was the first time we'd gone on a walk in over a week. You see my little girl, the one who it would become clear moments later that you were focusing on, has been sick all week and just narrowly missed spending Sunday in the hospital. She'd been cooped up, staring out the window for about eight days, and she was finally feeling better so I'd tried to think of something fun that we could do. I didn't want to walk all the way to the University. I knew I wasn't quite up for that. And there aren't a lot of places that are great down town for little ones that are both free and within walking distance. The parks around our house are kind of scary. The only one I could think of was the one at our parish, and the last time we went there we were told it wasn't for people who attend our church like I thought, that it's was just for the kids that go to school there, and I ended up lugging three disappointed kids all the way back home with promises to make cookies to temper the disappointment. So really, I didn't have a ton of ideas of things nearby to distract them that we could walk to. Except that Maggie, the little girl your screams were about, really, really loves fish. 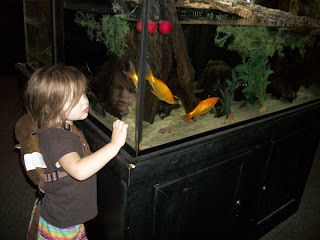 When we go to the zoo she loves the oversized feeder fish that the red eared sliders in the reptile room didn't eat. She could stand there and watch them swim around their little tank all day long. So we'd walked all the way to Petco to stand in their aquarium aisle and stare at the fish. It seemed like a good idea. I wanted Maggie to be able to get her wiggles out, after being cooped up for so long. I didn't want to just put her in a stroller and push her, even if it would be easier for me. I felt a little brave as I put her ten month old brother in the carrier. She kept handing me the strap to her monkey leash, impatient to put it on. I know it's probably hard for a free spirit like yourself to understand, but she actually likes wearing it. It gives her the freedom to not hold my hand all the time and she can actually walk a few feet further away from me, without me having to worry that she's going to dart into traffic at any given moment. Except the walk felt so much longer with that 25 lb baby strapped to my front. With the stroller that walk would have been easy peasy... without it, I was struggling by the time we reached the fish aisle. Then of course there were tears when we had to leave. She'd fallen in love with a little dwarf angel fish in the marine section and she didn't want to leave him there. There were plenty of brighter and more exciting fish that I tried to point out, but she only had eyes for her little angel fish friend and it took a while to recover from having to leave him there as we sobbed our way past the checkers and back onto the sidewalk. I was surprised. The last time she wanted something in a store was... never... so we don't usually have these types of tantrums. But oh, she'd fallen in love with that fish. The walk home wasn't as easy. She was pretty determined not to leave that little fish behind. 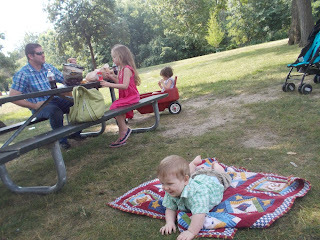 I was muttering under my breath about bringing the stroller next time, about not making the same mistake again. My shoulders ached from the carrier and the diaper bag and the three year old who was trying to pull my arm out of the socket. But when we'd gotten to that intersection she'd calmed down. The three of us were just standing there as I explained to the girls to watch for the little man on the sign who would light up and tell us that it was finally our turn to walk. You and your friends must have discussed what you were going to say, because you were all staring at us, grinning. Maybe it made you feel superior to lean all the way out of your window and scream at a "young" mom, letting her know that her child was obviously a dog since she was on a leash. After all, you're a lot older than me, you know a lot more than I do. 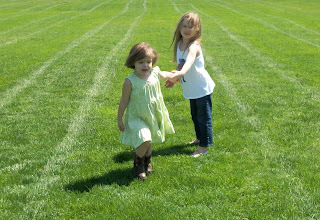 Your children, if you had any, probably ran around naked in fields of wild flowers, laughing in the warm sunshine. They never wore leashes. You had to let me know that she was a "cute puppy." I understand. You just couldn't help yourself. Of course you couldn't have known that I'd spent the day before in a little room with a counselor telling her how much it scares me that she doesn't seem to feel pain. You couldn't know that I've done everything I can to impress on her how dangerous traffic is, but that she just doesn't understand that yet, how the cars look shiny and fast and fun and she would love to run out to play with them. You probably have never felt the terror of having a child like that break away from the grip of your sweaty hand and head straight towards danger at a run. You didn't know any of those things. You didn't know that your words would bring tears to my eyes behind my sunglasses, as I stumbled the rest of the way home. But then again, I didn't know that a city worker working on the sidewalk on the other side of the street would smile widely at my children and say "I remember those days" in a friendly encouraging tone and that his words would help me stop the tears from falling and continue the last half mile of that long walk home. Yes, my dear helpful screaming friend, I do feel like I learned something from your loud insults, but I'm not sure that it was anything that I didn't already know. 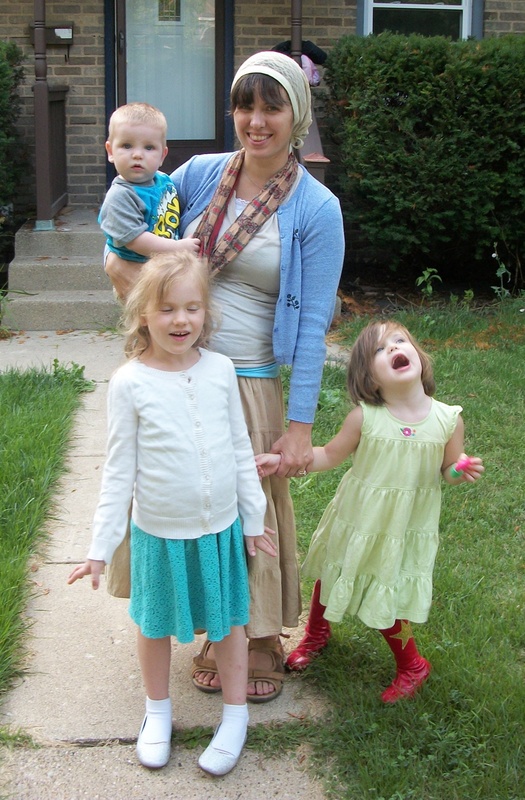 I know that people can be cruel, as you demonstrated so well to my three children as we walked home. I know that years don't necessarily mean that you've left behind the narcissistic focus of your youth and gained perspective or empathy for others. But the man who stopped from the back breaking work he was doing to offer my children a smile and a few kind words also reminded me of the kindness in this world and thankfully my children's minds were much more impressed by the "working man" who talked to us, than the crazy old hippie that just couldn't let a cruel thought go unspoken. So I'll pray for you. I'll pray that this late in the game you learn compassion and empathy and that you somehow realize that the people you encounter when you go outside are actual human beings with feelings and lives and experiences, rather than mere dumping grounds for your angrily expressed opinions. And I'll pray that next time you see someone and have the urge to shout something from your SUV window you'll either stop yourself altogether or say something kind. The world could you use a little more kindness, don't you think? Cammie, so beautifully done. So sorry you had that experience. But wow, God put that worker right in your path to encourage you and show kindness! Wow. It is so easy to say that leashes are awful... until you are in charge of a little one that runs at that drop of a hat. Anywhere. Anytime. No consequence enough to stop the behavior. I've been there, and it is not fun. 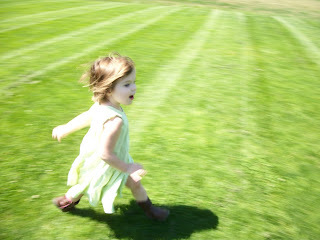 My daughter would fly away like a little rocket when she was young. You have no idea how much I wish I could come over, give you a hug and a cup of tea, and let you go take a long nap while I play with the kiddos. Ella had a unicorn 'backpack' (as we called it). She loved wearing it. It meant she didn't have to ride in the stroller or always hold my hand. It meant I could look at things and not worry what she was doing or if she was being stolen. It's like head covering, there will always be those that don't understand how something they see as 'degrading' can actually be liberating. I feel sorry for people that live in such sad, depressing worlds. Oh dear, I'm awful sorry about that. *hugs* ♥♥♥ Thank you for demonstrating such kindness... what an inspiration! Aw hugs. So sorry that happened to you, but thankful for the nice worker guy! We used to use one of those leashes. I hate how they have such a negative connotation, because they are actually great for toddlers and most kids love them. I read something the once that really impacting me about forcing toddlers and very young kids to hold hands. It was about how *hard* it is for toddlers to hold hands, because they literally have to hold their hand UP to reach the adult hand and it's hard and tiring. It can be literally uncomfortable...for them to always have to hold their hand up. None of my kids liked holding hands at that age, and I finally figured out that it was because it was hard for them to always have to hold their hand up. Anyway, my point is leashes are great because you can keep a toddler safe without having to hold hands and they still get exercise and can walk and have a little freedom in a safe manner. Considerer, you actually made me LoL with that "WTactualF" line. I'll need to file that one away for later. But Cam - holy Lord... that's just... that's TERRIBLE! So glad the city worker was there, but so incredibly NOT happy that woman decided she was anyone to poke her nose in places it didn't belong. I wish I could hug you through the screen right now. Prayers for you (and that woman, too). You don't know me, but I have followed your blog and your family's journey since the California days. I just have to say that you are a shining example of Christian perseverance and fortitude... beautiful and desirable virtues to possess. Your cheerful attitude and resourcefulness in the face of challenges big and small is inspiring. I am 9 years older than you and sometimes when reading your posts, I wonder if I could have been as strong a mom as you back in the day... heck, I wonder the same thing about myself today! You truly always try to make the best of any situation, it is delightful to read about the daily adventures of your three little people (I have a daughter Sadie's age and a son a bit older than Patrick, so it is extra fun for me to read). I know the diagnosis of Maggie was a blow, but I have no doubt you and your husband will handle it with the spirit and grace you have cultivated thus far in your young lives out of immense love for your daughter. Don't ever feel like you shouldn't "vent" on your blog... your readers will be here to offer encouraging words and prayers. That's terrible! I don't understand how people can be so cruel! You're a great mama and you're doing a wonderful job! Gah. Idiots are universal. Don't let 'em get you down. In all seriousness, I know how hard that can be sometimes. Thank God for that kind man! I had rather a lot going on yesterday, so I didn't comment on the Mae post, but know that I've said a prayer for her and you. She is very blessed to have parents who will be such great advocates for her! And, judging by your posts over the years, she's a smart little whip and will make amazing progress! You should condense this post and send it to your local newspaper. Oh Cammie, I couldn't help but tear up as I read this. It is so hard to be a mother. I don't understand how people can be so oblivious to this fact. Prayers for you - you know you;re doing an amazing job right?! Our monkey has been our best friend for many years now and an absolute lifesaver. Congrats for getting out of the house in those circumstances. Animals can be an obsession for many girls on the spectrum so the fish may hold some bargaining power with Mae in the future. Don't give that lady benefit of any more of your thoughts, you focus on those beautiful kids of yours. haha! Considerer's line really sums it up for me. I agree with JoAnna. This post would be awesome printed in a local paper! The ignorance, cruelty, and nosiness of people is truly astounding! How those people could have possibly thought it was any of their business to even comment on, let alone insult, a random stranger's parenting while she's standing at a light is beyond my understanding. I have to say, you probably handled it a lot more charitably than I would have! Thank you for this open letter. How many times have I thoughtlessly judged another mother for doing something "I would NEVER do to MY child!" without considering her situation, my lack of experience, God's will for each of us? Thank you for the reminder to keep an open heart. I sweetie--can I call you that? My heart breaks for the journey you went on with your family. I've never read your blog but found it through another's link. I am angry for you. I am mad for you. I am very touched that you will pray for the other lady who yelled at you. YOU ARE STRONG. YOU ARE AN AWESOME MOTHER. And that my friend is something I learned from reading one post. My parents had me leashed me when I was younger. I think I turned out ok? My son is autistic and we have a backpack leash for him because he hates holding our hands when we're out for a walk. I thought the backpack things were strange... until I had use for one. Ignore the wenches. They have no freaking clue. This is awful. I'm so sorry someone treated you four so rudely! My goddaughter reminds me a lot of Mae, and with a little one that fearless a kiddie leash can be so freeing for mom and child! Also prayers for sweet Mae as you try to figure out what challenges she may be facing. Your children are so beautiful and it sounds like you're doing a wonderful job!!! Oh, I am so sorry that some hideous women gave service to satan in your presence! It is so crappy when that happens. My friend and I both read this today and she said it made her so mad she could not post anything but that her prayers are with you! Mine too. As a nutty hippie myself, please know that I would never judge you for the leash... I mean, my daughter doesn't seem to be autism spectrum and she still bolts away; she hates her stroller. And it is VERY hard to make a little one hold your hand. You weren't doing anything wrong-- and I empathize so much with having nothing to do and the parks being scary near your house; we live in a crap neighborhood and there's nothing for me to do with my little one either except bundle her onto the bus to go to the library, and then the bus driver yells too. It is so, so hard to be a mom. I am so sorry that mean people try so much to make it worse. Ugh. You handled the situation beautifully. Just discovered your blog via Calah Alexander. What a beautiful family you have. I also have a Margaret Rose, we call her Maggie. And I have an almost-three-year-old I fear might be on the autism spectrum. He sounds a lot like your Maggie, though he is verbal. May God bless you, Momma!! Well written, as I my cheeks got hot and my temper flared just reading it. 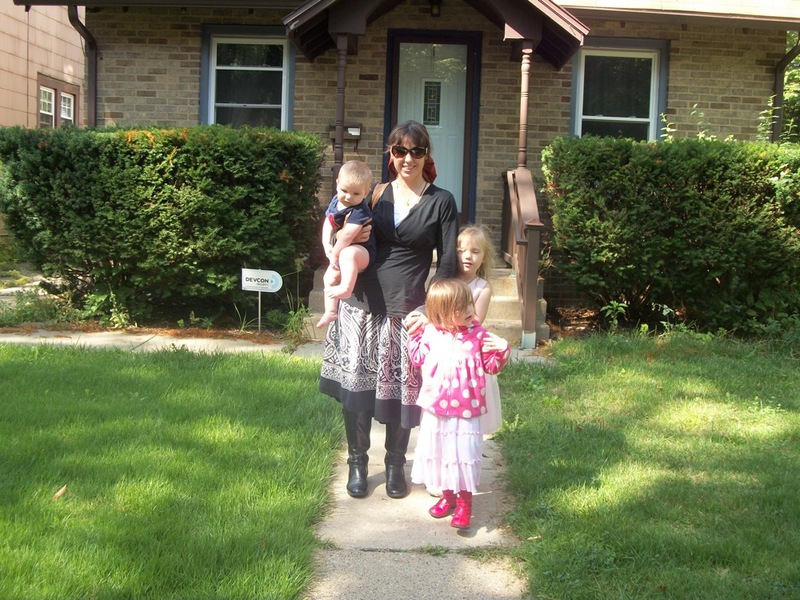 I am an "older" mom now and I would be willing to bet those busy bodies have very short memories of their own childrearing days, if in fact they ever had any children at all. I remember resorting to a "crib tent" for my fourth child, to keep him from climbing out of his crib at the age of 11 months and potentially escaping out the front door in the middle of the night (he was a Houdini of epic talent), just so I could get a little sleep. I'm sure the Parent Police would have considered that horrible! Walk a mile in my shoes is all I can say! Good for you--be glad you have an outlet for getting it off your chest! It still amazes me how thoughtless people can be. Sadly, it really shouldn't anymore. The city worker was an angel in disguise. God knew exactly what you needed at that moment. Ann Seton - I had never heard that phrase you used in your post "gave service to satan" but how incredibly descriptive!! Seriously... while I can truthfully say it isn't in my personality to behave as that woman, I know I have been judgmental in the past. How many times have my actions or thought gave service to Satan? Shudder.... I will be thinking about that phrase for quite awhile. In summary: You are a classy lady. Truly. I may be older than you in years, but I still have things to learn from you. Thank you for sharing your life with us. I'm aghast. So glad someone posted this on my FB page so I could read your story. What a good mom you are. Wishing you well with your young daughter and the challenges ahead. When I first read this, I thought, "Surely those women didn't say that in a mean way... Surely they must have simply been joking...". But then I thought more about it and decided that, sadly, yes, they may well have been mean and nosey and rude, and meant to be. :( I simply cannot fathom yelling out the car window to anyone, much less to say something unkind. It just boggles my mind. Our 2 1/2 yr. old grandson Ben (busy, loud, always running at top speed, completely without any idea of boundaries) has a little "puppy backpack" with the "leash". He rarely likes to hold anyone's hand for long, and - at least until he realizes he can't get too far - he seems to like the bit of freedom it gives him. This too shall pass. Keep being the wonderful mother you are. We had a giraffe backpack leash. My son adored it. We used it a lot in airports and would get awful stares and comments. People are ridiculous. Wow! I'd like to say that it is completely unbelievable that someone would do that, but I can't. I've experienced the stares and dirty looks. I've heard how my son is too big to act 'like that.' My skin is tougher than it was a few years ago, for sure. But that doesn't stop our hearts from breaking or our eyes for welling up. Which is exactly what I did while reading this. But as I was typing a thought entered my mind about how the sword pierced Mary's heart as this 'sword' pierces ours. It's not right, of course, but perhaps we can be a little closer to our Heavenly Mother, knowing that our children are sometimes disregarded like hers was. She knows our hearts on this one. Great job! I cried when I read this too! I too have encountered so much horrific behavior from adults toward kids. My husband had sexually abused our 8-year-old. I reported him and he was arrested and charged and we got an order of protection against him. Since then the neighborhood has turned against me and my two kids. They found out the private details from some police officer who's friends with one of the gossipy neighbors and now no kids (except one) will look her in the eyes or say hi to her. It is so disgusting how some adults are. Beautifully worded. People can be so judgmental. Plank-in-their-own-eye-much? Sounds like you're a fantastic mom! This stage is so short. It's so difficult and so important and so fleeting. And you're making the most of it. Kudos.